(01-27-2019, 04:10 PM)mjlan Wrote: No, you do not need to change the cylinder heads to change from a two barrel carb to a four barrel carb- just the intake manifold. The carburetor flange on the intake needs to match the carburetor you are using. (01-27-2019, 07:51 PM)Don C Wrote: Yes, that one will work just fine. However, I agree with Hemikiller, I would get it running correctly with the two barrel carburetor firdt. Be good experience rebuilding it, and after you get it running you'll be able to see if the engine needs anything else. You don't want to install the 4-barrel manifold and the find out the engine needs rebuilt or a valve job. You can get vacuum hose diagrams here. However, if all of the emissions have been removed and you don't need to replace them to get it registered I would keep it as simple as possible. A single vacuum advance and the one vacuum hose connecting it to the carburetor. Alright, so i adjusted the knob. it was all the way to the rich side i think, it was to the left. moved it over a little bit. now the car idles better and shifts better. Crazy how such a small adjustment changed the whole cars feeling. If the engine is a 73, it looks like someone did eliminate the PCV valve and replaced it with a spacer from an earlier car with the vacuum port. Glad you got it running better. Not sure how I thought it was a 302 car. What was the "knob" you turned? You'll hear a lot of differing opinions on what size carb to use for the 4 barrel swap. Here's mine - if you plan on keeping the engine stock and never doing anything other than a stock rebuild and the mildest of cams and a dual exhaust with manifolds - get a 600 cfm. If you plan on headers, a larger cam etc - get a 750. Again, the Summit carbs are a great value and run really well - I have the earlier Holley 4010 model on my '71 and am very happy with it. 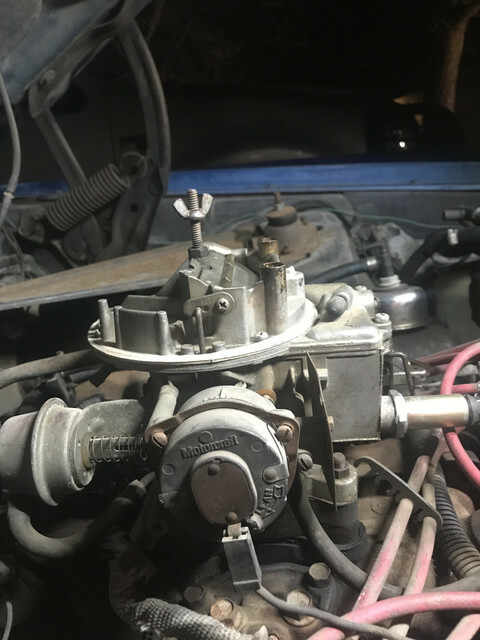 (01-28-2019, 09:42 AM)Hemikiller Wrote: If the engine is a 73, it looks like someone did eliminate the PCV valve and replaced it with a spacer from an earlier car with the vacuum port. Glad you got it running better. Not sure how I thought it was a 302 car. What was the "knob" you turned? its the side thing on the passenger side where it has the 2 arrows and 7 slots saying lean clockwise. it was full rich, turned it to the middle and the car idled better, shifted better too. i just got my paycheck today so i bought the rear window weatherstrip and the rope for it as well. ill let yall know if i shatter my rear window. after moving the dot to the middle (i made sure to take before pictures in case i messed up) it was acting a-lot better. shifts much more smoothly as it doesnt idle high then low then high, it used to jolt into gear between R and D but it is now seamless almost. Park and Reverse have a very small shake, putting it into reverse from park will make it idle low for a few seconds then it will shoot back up (HEAT ON, ALL LIGHTS INCLUDING DOME, While applying brakes) so it can handle being under load without stalling out now as well. kicking on the ac won't shut the car off as well. But please do inform me on how to delete the EGR thing as it has empty lines that dont go anywhere, and makes the car seem less tidy. When i have the new plugs, wires, & distributor caps im going to re-route it nicely. as of right now its a pigeon nest in there. Update on the mustang: No trim, No window again. i put the window in once already but its back out again for the headliner. I managed to finally get my hands on the emblem for the side of the roof, itll be here in 3 days. i have the first section of the headliner glued in, its proving extremely difficult, luckily I managed to convince my parents to let me borrow the garage for the "weekend" which has now turned in to a week. Before i order the new intake and carb I wanted to confirm deleting the EGR is a bolt on affair where if you buy a non EGR intake i can get rid of that god awful thing in between the carb and Intake.